Wonderful lake front cabin at beautiful Bass Lake. 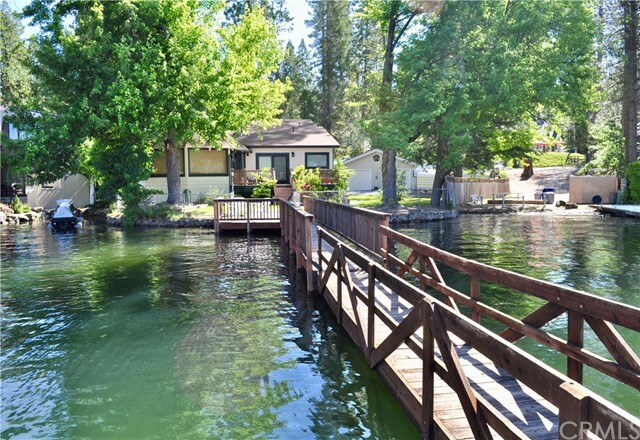 This is an amazing property with a private dock, two fireplaces, a den, great room, 3 bedrooms, 2 -1/2 baths, lake view master suite, 3 car garage, covered boat parking, parking area,and a security gate, Part of the cabin has vintage Pine showboard with a beautiful orange patina. The newer master suite has vaulted ceiling with exposed beams and spacious master bath. The private dock sets in Ducey's Cove with swim ladder and the 3-side tie areas. Super garWonderful lake front cabin at beautiful Bass Lake. This is an amazing property with a private dock, two fireplaces, a den, great room, 3 bedrooms, 2 -1/2 baths, lake view master suite, 3 car garage, covered boat parking, parking area,and a security gate, Part of the cabin has vintage Pine showboard with a beautiful orange patina. The newer master suite has vaulted ceiling with exposed beams and spacious master bath. The private dock sets in Ducey's Cove with swim ladder and the 3-side tie areas. Super garage with plenty of room for your cars and shop items. This is a great vacation home with vacation rental history on file. This years reservations to be honored. Most furnishings included. Call your agent to see this before it gets away!! !